An unfit lion tamer quits his circus and sets out on the road in rural Italy in search of a lost iron amulet, bent by a notorious strongman years before. So goes the wandering premise of Mister Universo—seemingly descended from the stock mythology of Fellini but quite contrarily possessed of its own bracingly modest realism—by Tizza Covi and Rainer Frimmel, who have crafted a small world from the hard-luck trailer dwellers outside of Rome. A narrative strand that would appear contrived is instead graced with an extemporaneity derived from documentary, as Tairo Caroli reappears from La Pivellina (2009) as a variation of himself, his lions sick and dying, his talisman stolen, and his only ally a superstitious red-headed contortionist with an aching body whom he promises, someday, to marry. A road trip in search of Arthur Robin, the former Mister Universe who might bend him a new good-luck iron, is occasioned by little more drama than the everyday: a bend in the road where the forces of gravity seems to have reversed; stove-top espresso with members of the extended family; an arm-wrestling match; an overheated radiator that gets repaired by an uncle who could’ve been a singer; a brief encounter with a chimpanzee who appeared in Fellini and Argento films; a nap on his grandmother’s sofa; cousins who sew his tattered black leather jacket; and a few leads to the whereabouts of “The Black Hercules,” as Robin was known. 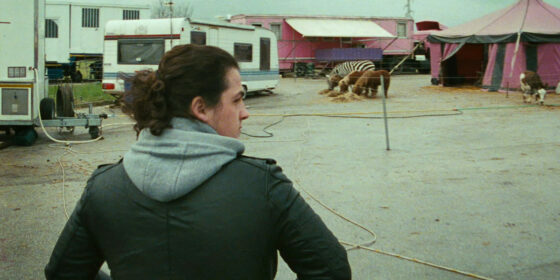 Tairo’s eventual meeting with his hero is revelatory for its lack of hyperbole: Robin lives in a trailer with his wife and works in a roadside safari park near Milan (circus and amusement parks are, in the film’s view, synonymous with melancholy). Implored by Tairo to bend one last iron, the affable octogenarian strongman concedes, “Even time passes for me.” Like the gravitational anomaly in which water appears to flow uphill, Covi and Frimmel’s work acts like a force of nature, showing what remains when the luck and the muscle have run out.